and heated lap pool with underwater music; daily yoga classes and AquaFit; village shuttle and on-the-slope ski valet; and guided excursions with Fairmont Whistler’s Experience Guide. Fairmont Chateau Whistler poses an enviable dilemma for meeting planners: winter or summer? As the landmark property at Whistler Blackcomb ski resort, Canada’s top ski destination and site of the 2010 Winter Olympics, the 539-room ski-in/ski-out chateau infuses wintertime corporate events and business meetings with seasonal festivity. However, once the greens awaken, golfers hit the links at the 18-hole Robert Trent Jones Jr.-designed golf course, while summer hikers discover forested terrain and canoers glide through serene glacial lakes. Year-round, groups may embark on off-the-beaten-path adventures with a Whistler Experience Guide—everything from cycling the Valley Trail and swimming Whistler’s lakes to snowshoeing under the stars. Whatever the season, the hotel offers classic elegance in a modern alpine setting. Charming rooms and suites pamper guests with down-filled duvets, signature toiletries, and luxurious robes. Equally impressive offerings are available in the on-site cuisine. Five year-round dining options (plus one more in summer and winter) include signature steaks at the Grill Room, casual fare at The Wildflower, quick bites at Portobello Market and Fresh Bakery, and light meals and spirits by outdoor fire pits at the Mallard Lounge and Terrace. For conferences and special events, meeting planners choose from three divisible ballrooms, specialty suites, and rooftop terrace space. 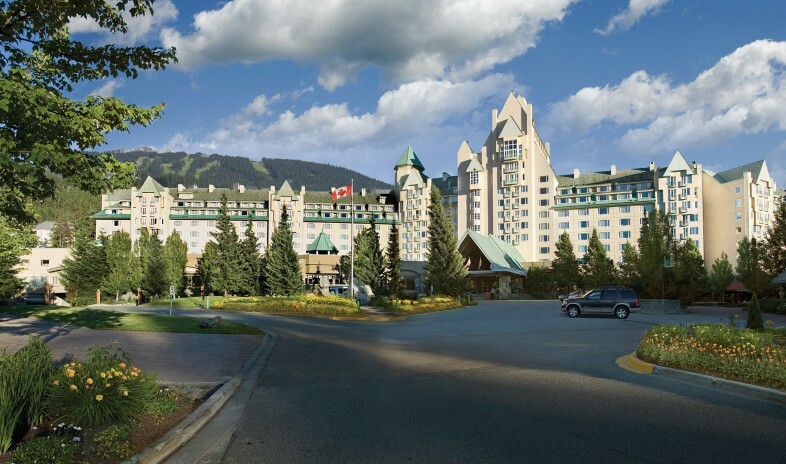 The Fairmont Chateau easily and expertly hosts functions for 10 to 1,500 attendees with a distinctive mountain resort ambience. simply one of the best. amazing spot, unique and worth the journey from vancouver. Working with this hotel was a meeting planners dream. They were beyond accommodating -- from understanding the needs of a few of our attendees who were traveling with their families to arranging ground transportation for all of our guests. The meeting facilities were superb, and the staff was extremely helpful and accommodating. Overall a great experience. On Thursday, December 21 Fairmont Chateau Whistler’s Portobello Deli, which closed this fall for an extensive multimillion dollar renovation, reopens to reveal a fresh design and new elevated casual dining experience. Showcasing an animated open kitchen, Portobello has expanded its dinner offering under the direction of renowned executive chef Isabel Chung to include open-flame rotisserie chicken, pork ribs, and smoked brisket. New hardware in Chef Isabel’s kitchen includes a Rotisol rotisserie, an Alto-Shaam Smoker, and not one but two stunning, antique-styled Miwe Wenz 1919 Ovens shipped directly from Europe. With the only kitchen of this kind in Whistler, Chef Isabel and her brigade will ensure the finest fare is perfectly created in front of each and every guest. Meanwhile, Portobello’s beverage offering has been expanded to provide a full service bar focusing on local craft beers on tap, perfect for the Chateau’s new après ski experience offered daily. Local Whistlerites and frequent Fairmont guests will be delighted to learn the Chateau Whistler deli has maintained its gourmet barista bar which perfectly complements Portobello’s legendary made-to-order sandwiches and delectable pastries. The new market-style retail space features curated home décor, kitchen wares, and collectables – perfect for guests who want authentic hand-crafted gifts from local Whistler artists and purveyors – as well as Caffe Umbria Coffee and Fairmont’s new signature Lot 35 tea. The Portobello redesign now offers ‘family style’ seating in a rustic, modern alpine setting with exposed wood, brick, and metal fixtures. Award-winning Calgary-based FRANK Architecture created the striking design while B.L.T. Construction orchestrated the renovation. A new stand-alone website and mobile app will launch early 2018 to allow guests to place food and beverage orders at Portobello Deli while on therun, literally. Those about to hit the slopes or shooshing down the last run of the day can make the most of their mountain time by placing advance orders. Fairmont Chateau Whistler recently completed a five-year, $23-million renovation including 11 brand new 600 square foot Alpine Suites. Intimate and perfect for couples with a luxurious bedroom, cozy fireplace, and modern bathroom with spa shower, the aptly named Alpine Suites are situated on the highest floors of the hotel and offer breathtaking views of Whistler Blackcomb and the Coast Mountain Range. Nestled at the base of Blackcomb Mountain, discover a chateau-style hotel with luxurious rooms, a wide array of dining options, award winning golf and a full-service spa. Opened in 1989 with 539 guestrooms and 32,000 square feet of meeting space, this mountain resort is the ideal location for a leisure stay as well as meetings and incentive programs. For more information on luxury Whistler getaways and special offers, please call Fairmont Chateau Whistler at 1-800 606-8244 or visit online at www.fairmont.com/whistler. Whistler, BC October 18, 2018 –Today Fairmont Chateau Whistler Golf Club was named the 2019 North America Golf Resort of the Year by the International Association of Golf Tour Operators (IAGTO). The winners were announced during the opening address of the 21st International Golf Travel Market (IGTM) in Ljubljana, Slovenia in front of an audience of 1,300 international golf tourism delegates. This is the first time a Canadian resort has received this accolade. The award, voted on by 682 golf tour operators in 62 countries, recognizes the industry’s best based on the following criteria: customer satisfaction; quality of golf courses and accommodation; value for money; support from suppliers, tourist boards & airlines; professional conduct of suppliers; and accessibility to tee times. The definitive mountain golf resort, Fairmont Chateau Whistler Golf Club celebrated 25 years of operation in 2018. Audubon Cooperative Sanctuary Certification - Recognizing environmental responsibility. The Fairmont Chateau Whistler golf course presents a fun and challenging experience for players of all levels. It drapes along the foothills and lower slopes of Blackcomb Mountain, traversing creeks, ponds, granite outcroppings and thick stands of ancient Douglas fir. Along the way it thrills players with dramatic shot-making opportunities, spectacular mountain vistas and exceptional opportunities for wildlife viewing. This Audubon-certified course was designed by Robert Trent Jones, Jr. and opened in 1993. To make a tee time, please visit www.fairmont.com/whistler/golf/ or call the Fairmont Chateau Whistler Golf Shop at (604) 938-2092. Information about available golf packages at Fairmont Chateau Whistler is available here. Whistler B.C. April 4, 2018 – On March 21, Fairmont Chateau Whistler was awarded “Best Event Produced by an In-House Team at a Venue or Corporation” at Canadian Special Events Magazine’s annual Event Awards Gala. The Fairmont’s ‘All About Me’ women’s weekend got the national nod, beating out contenders WestJet and Calgary Stampede, among others, for the award. The "All about Me" women's weekend retreat provides an opportunity for guests to realign their mind, body, and soul in a luxurious mountain resort setting. This year’s retreat takes place October 12 – 14, 2018. Further information can be found on Fairmont.com. Whistler-based Celebrate Events was recognized for “Best Wedding Over $75,000” for the Giesbrecht Gill Wedding, which took place on the Woodlands Terrace at Fairmont Chateau Whistler while “Most Creative Table/Centre Design” went to Vancouver’s Christopher J Design for Step into Spring, a collaboration with Fairmont Chateau Whistler and Rare Indigo. Fairmont Hotels & Resorts is where occasions are celebrated and history is made. Landmark hotels with unrivalled presence, authentic experiences and unforgettable moments have attracted visitors to Fairmont and its destinations since 1907. The Plaza in New York City, The Savoy in London, Fairmont San Francisco, Fairmont Banff Springs and Fairmont Peace Hotel in Shanghai are but a few of these iconic luxury hotels, forever linked to the special places where they reside. Famous for its engaging service, grand public spaces, locallyinspired cuisine and celebrated bars and lounges, Fairmont promises a special brand of thoughtful luxury that will be remembered long after any visit. With a worldwide portfolio of more than 75 hotels, Fairmont also takes great pride in its deep community roots and leadership in sustainability. Fairmont is part of AccorHotels, a world-leading travel and lifestyle group which invites travelers to feel welcome at more than 4,300 hotels, resorts and residences, along with some 10,000 of the finest private homes around the globe. Whistler B.C. – Fairmont Chateau Whistler recently announced it has completed an extensive five-year, $23-million renovation which included all 3,000 square metres (32,000 square feet) of meeting space in the 539-room ski in/ski out hotel. New carpets, wall-coverings, chandeliers, banquet chairs and live-edge tables, plus foyer furniture and décor - all done in striking modern alpine design - are just some of the elements meeting delegates will enjoy following Fairmont Chateau Whistler’s recent renovation. Additionally, guestrooms, corridors, and 150 guestroom bathrooms received complete facelifts while a comprehensive update of the health club and pool complex was also completed. Furthermore, Fairmont Chateau Whistler unveiled 11 brand new 600 square foot cozy and contemporary Alpine Suites, situated on the highest floors of the hotel. To celebrate the newly revealed space and Canada’s 150th birthday, Fairmont Chateau Whistler is offering up to CAD $150 worth of complimentary enhancements per delegate for any new meetings or events in 2017. Optional inclusions comprise of upgraded guestroom, complimentary meeting room, Canadian themed coffee break with legendary housemade Bacon Maple Cream doughnuts, and breakfast with pancakes and Canadian maple syrup, among many others. Restrictions apply. To learn more, contact rfp-mtn@fairmont.com or call 1-800-606-8244. Whistler B.C. – Today Fairmont Chateau Whistler revealed 11 brand new 600 square foot suites. Intimate and perfect for couples with a luxurious bedroom, cozy fireplace, and modern bathroom with spa shower, the aptly named Alpine Suites are situated on the highest floors of the hotel and offer breathtaking views of Whistler Blackcomb and the Coast Mountain Range. “Heeding the needs of our most discerning guests, we created a new suite experience which seamlessly blends the highest quality product with the warm and inviting service for which Fairmont is renowned, framed by picturesque mountain views,” stated Managing Director Norman Mastalir. The Alpine Suites boast a bedroom with a bespoke king bed placed before a bold feature wall plus a separate living area with sectional sofa and unique built-in fireplace. The inviting ambiance is born from a marriage of subtle modern finishes and rustic textures of antiqued bronze, rust iron, and distressed woods. The furniture’s clean lines layered with intriguing textiles and abstract artworks of local attractions enhance the sense of place. The suites, designed by Hirsch Bedner Associates, took two and a half months to complete with the 11 suites having been created from 22 of the hotel’s Moderate Rooms. Fairmont Chateau Whistler now has a room count of 539 rooms and suites, including 55 Fairmont Gold rooms. This project concludes an extensive five-year, $23-million renovation which comprised of 150 bathrooms receiving complete facelifts including new plumbing and rain head showers; room enhancements including new décor, soft furnishings and electronics; corridor décor updates including new Canadiana artwork; a complete renovation of the pool complex; and all 32,000 square feet of meeting space receiving new carpets, wall-coverings, chandeliers, furniture, and foyer décor. Rates for the Alpine Suites start from CDN $459.00 per night and can be booked online by calling 1-800 606-8244 or clicking www.fairmont.com/whistler. Fairmont Hotels & Resorts connects guests to the very best of its destinations worldwide, providing travelers withmemorable travel experiences, thoughtful and attentive service and luxury hotels that are trulyunforgettable. Each Fairmont property reflects the locale’s energy, culture and history through locallyinspired cuisine, spirited bars and lounges and distinctive design and decor. With more than 70 hotelsglobally, and many more in development, the Fairmont collection boasts some of the most iconic and distinctive hotels inthe world. This extraordinary collection includes The Plaza in New York, The Savoy in London, Fairmont Grand Del Mar, Dubai’s Fairmont The Palm, Fairmont Peace Hotel in Shanghai, Fairmont San Francisco and Fairmont Le Château Frontenac in Québec City. Fairmont is part of AccorHotels, a world-leading travel & lifestyle group and digital innovator offering unique experiences in more than 4,000 hotels, resorts and residences, as well as in over 2,600 of the finest private homes around the globe. For more information or reservations, please visit fairmont.com.